Sharon is our Office Manager. She graduated from Oregon State University with a Bachelor's degree in Technical Journalism and Marketing and has a degree in physical anthropology. Prior to joining our team 19 years ago, Sharon spent 6 years in the retail industry as a buyer and area sales manager. 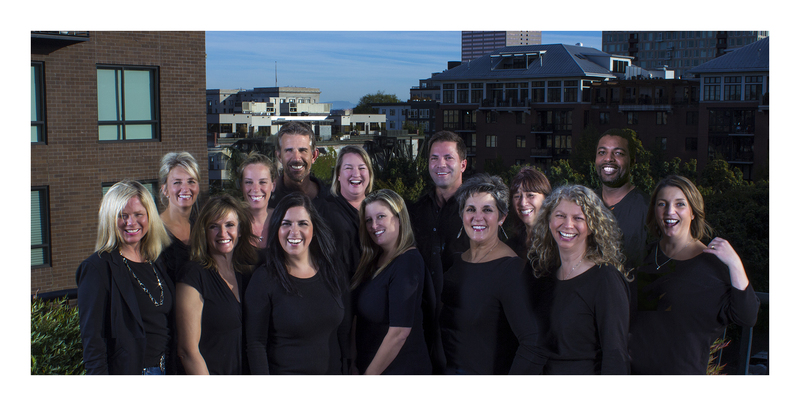 She has been a member of the Oregon Dental Executive Association since 2006 and currently sits on the Board of Directors. Robyn is our Insurance Coordinator. Robyn attended the University of Portland and received a Bachelor of Arts in Psychology. Robyn joined our team with 10 years of insurance experience. Robyn has been with us for 13 years. Lisa is one of our Appointment Coordinators and has been with us since 1999. Lisa has a Bachelor of Arts in Liberal Studies from Oregon State University and has worked in the dental field for over 20 years including general dentistry, specialty offices and dental claims processing. April has been with Bridgeview Dental Associates since 2011 and works as both an Insurance Coordinator and Insurance Coordinator. April has 10 years of dental administrative experience. Val is one of our outstanding Hygienists. She is skilled in the latest techniques for preventative and periodontal care. Val attended Idaho State University where she earned a Bachelor of Science degree in Dental Hygiene and has pursued extensive continuing education in periodontal, cosmetic and comprehensive restoration as it relates to hygiene. Val has been with Bridgeview Dental Associates for 14 years. Marilyn is a member of our outstanding Hygiene team. She is skilled in the latest techniques for preventative and periodontal care. Marilyn attended Oregon Health Science University where she earned a Bachelor of Science degree in Dental Hygiene. Marilyn has also taken extensive continuing education in the latest non-surgical periodontal treatment. She has been with us for 28 years. Kim joined our team of outstanding Hygienists in 1999. She is skilled in the latest techniques for preventative and periodontal care. She received a degree in Dental Hygiene from Portland Community College and has trained as a paramedic. Kim has been with us for 16 years. Lori came to our Bridgeview Dental Hygiene team from Ohio. She received her degree in Dental Hygiene from Cuyahoga College in 1995 and completed her Bachelor of Science degree in Business Management in 2004. Lori is skilled in all aspects of periodontal and preventative care. Lori has been with Bridgeview Dental Associates for 6 years. Jackie us part of our hygiene team and earned a Bachelor of Science degree from Oregon Health Science University. She brings a wealth of hygiene knowledge to the hygiene team and specializes in periodontal treatment. Stacey is a registered, expanded function dental assistant and is Dr. Parks' primary assistant. She assists him in all procedures and helps to make our patients as comfortable as possible. Stacey has been with us for 23 years. She is a member of the American Dental Assistants Association. Shanda is a registered, expanded function dental assistant and assists both Dr. Briles and Dr. Parks. Shanda joined our team 2 years ago and brought with her years of experience as a dental assistant. She is a member of the American Dental Assistants Association. Rakenya is a registered, expanded function dental assistant. He graduated from Concorde Institute in 1998 and has 17 years experience as a chairside and surgical assistant.